You should know that your presentation audience will remember only some three or four of your points 24 hours after your well-crafted presentation. Now that might come as a surprise to you. And if your presentation technique involves a series of PowerPoint bullet lists then it will be a shock. 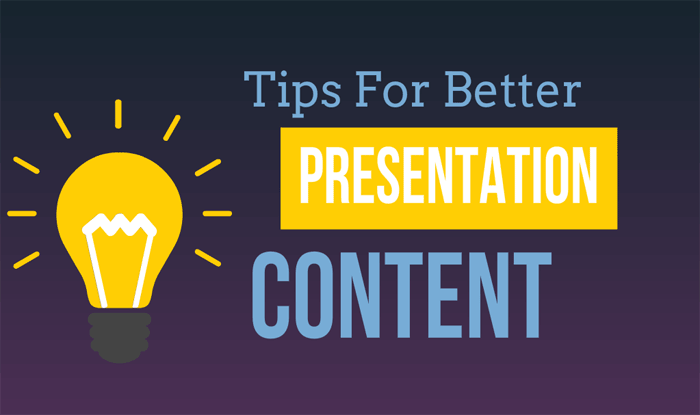 So it’s time to get better presentation content for your next presentation. Your audience’s ability to absorb information during your presentation is heavily influenced by your delivery style, presentation technique and skills. Use a theme in your presentation. Set the right pace for your content. Present only three or four points. To help, you should aim to use a theme within which to wrap the presentation. Themes actively help an audience to capture your points and then make sense of them. An audience will be thinking through your presentation at the rate of some 600 to 700 words a minute. And in the meantime you will speak at the rate of 120 to 150 words a minute. No more than that. There’s a clear gap. And that gap is typically filled by audience clutter or their active thinking on your content. In the case of audience clutter—your presentation content is not reaching them. They are absorbed in what’s going on in the office or at the football park. Distracted. It’s not a good scenario. But the audience that is actively thinking about your content is the perfect scenario. An engaged audience will ponder the impacts of your points. They will look for meanings. And they will look for implications. In short, they are interested and absorbed with your content and the points you make. Of course that’s not happening with this Whitbread results presentation. Need to fill the gap between detachment and engagement? You won’t do it if you simply speak faster and faster. And you will do your cause no use if you present more and more bullet points. More information simply builds the potential for greater confusion and linguistic misinterpretation among your audience. Make a benefit. You should frame each point with audience benefit or outcome in mind. Because it’s about them, for them and it concerns them. So stress the benefit to them. Make them clear. Because there’s no room for uncertainty or vagueness. So, ensure your points are clear, concise and precise. Edit your choice of words and avoid complexity. Make them self standing. Since any point made in your speech must be self standing. When they are not they merge together and lose their distinctiveness. Once you lose distinction between your points, you are lost. If a point can’t stand alone then it doesn’t deserve to be made. Make them relevant to your theme. You selected your presentation theme to help your audience to remember your speech. So the theme has to be relevant and vice-versa. If there’s a conflict, change either the theme or the point. Better presentation content, with well-managed points and themes, is one of the essential presentation skills. When you need the best possible results from your presentation you must focus on better presentation content. Your audience will recall only three or four points. Make sure that they are the right points. For more skills tips, you can always attend a public presentation training course. And, because we use more than 40 presentation training centres across the country, you are never that far from your nearest course. So, please don’t hesitate to get in touch when you want to attend a scheduled course or have us organise a tailored course for your team.